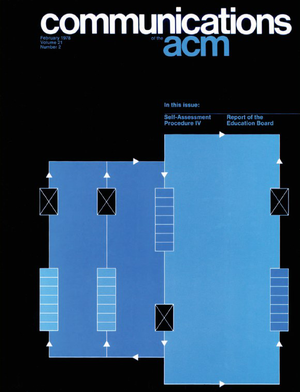 The Communications of the ACM is, since 1958, the flagship magazine/journal of the Association for Computing Machinery, a professional society for computer scientists and computing professionals. In its current format, which dates to a revamp initiated by incoming editor Moshe Vardi in 2008, it carries a mixture of news items, interviews, op-eds, columns (1–3 pages ea. ), articles on current topics in computing practice (3–8 pages ea. ), and submitted short- to medium-length research papers or review articles (8–12 pages ea.). In each issue, a few articles (but not all) are open access. Infuriatingly, the table of contents does not say which ones. You can find out by picking an article and clicking, upon which you'll either be redirected to a URL ending in .../fulltext if you can access it, or one ending in .../abstract if you can't. As an ACM member, I do subscribe to the print edition, and could log in to read everything online. But I also sometimes like to link other people to non-paywalled articles on the internet, so it would be nice to easily know which ones are OA. Therefore I wrote a simple script to do this for me, scraping the table of contents for every issue, and then doing an HTTP HEAD request for each article, to see whether it redirects to the abstract or fulltext. The results are below, supplying the missing index of open-access CACM articles. These are the CACM articles that were open-access as of March 14, 2016 February 11, 2018. I only list regular articles here, not including introductions, letters to the editor, interviews, news items, columns, op-eds, etc. Some of those are also interesting and OA, but to keep this list browseable I'm limiting it to just articles. There's a lot of good material below, which I hope more people will read. There's of course even more good material in CACM that's unfortunately not below. For the rest, you could join ACM or browse from your local library, among other options. ACM took its first step towards open access in 1999, moving from a fully closed, traditional publishing model, to what's sometimes called a "green OA" model. ACM didn't make its own archives open-access (that would be "gold OA"), but it did change its copyright terms so authors now have blanket permission to self-archive papers in an open-access repository of their choice, such as an institutional repository or arXiv.org's CoRR. In the 2008 discussions about overhauling the journal, a substantial portion of the membership would have preferred the "gold OA" option, but it wasn't ultimately chosen (see Vardi's opinion). A subset of each issue did begin to be made open-access, coinciding with a new, modern website, now featuring a blog, news section, and HTML versions (rather than only PDF) of the articles. From the debut of the new format in July 2008, typically the front matter, columns, and 2–4 articles in each issue were made OA. That continued for about 4 years. For some reason unknown to me, from August 2012 through the end of 2014, the practice seems to have temporarily lapsed (as you can see in the index above), with only a handful of articles being made OA, often none at all, not even the editor's introduction to the issue. From January 2015 the previous policy seems to have been restored again. ACM occasionally will make something OA that wasn't originally published as such, but seems to do so only rarely. Once was in apparent response to a widely retweeted twitter joke I made about an ironic paywall. They inconsiderately ruined my joke by flipping the article to OA! Part of this webscraping exercise was also to satisfy my curiosity over whether any pre-2008 articles had been made OA. I checked everything back to 1958, but found only two: the 1999 news item announcing the self-archival policy, and a 2007 article by Peter Naur. In my opinion, ACM should consider making at least a handful more things retroactively OA, perhaps a few landmark CACM articles. That would both be good for our profession, by bringing important historical articles to more readers, as well as for the visibility of CACM's archives. Ed Freeborn mailed in to point out (thanks!) that one of the articles I had listed as open-access appears to have been subsequently closed. So I re-ran the scraping script and updated the list to reflect current open-access status, plus, while I'm at it, adding the CACM issues up through February 2018. Between when I checked in March 2016 and again in February 2018, four articles have been made newly open-access (1, 2, 3, 4), while 27 (!) previously open-access articles were closed. It's not clear why these four articles in particular were opened. But all 27 of the newly closed articles were published between April 2015 and March 2016, which were the most recent 12 issues at the time I first posted this list. So it's possible that CACM is using some kind of rolling open-access model, where a portion of new articles are temporarily opened but then some are later filed into a closed archive. But it hasn't been doing that consistently, if so. It would be nice if there were more transparency around what exactly the policy and intent here is.